At the heart of every Aqua² Tankless water heater is a revolutionary Flow-Tech® Heat Exchanger typically found in heating boilers. For the first time ever, boiler technology is being applied to the tankless water heater… The outcome is a unit that produces up to 7.02 GPM, can be vented up to 60’ with 2” PVC, has en EF rating of 97% and has recirculation capabilities and on board circ pump all built in to one tidy and well thought out cabinet. Gone are the days of messy wires, hot water fluctuation, and nuisance service calls. This user and service friendly design performs even better than it looks. Watch the Radiant company overview video. 54 years later, and thanks to the tremendous drive of the sons Luciano and Paolo, we now manufacture more than 180 different types of boilers: high-tech condensing units, atmospheric units along with solar/heat pumps and tankless water heaters. We proudly export our products to more than 40 countries worldwide, and pride ourselves that our products are still 100% made in Italy. The remarkable strides we have made and continuous efforts in our R & D department have allowed us to develop several products we are proud to call our own. 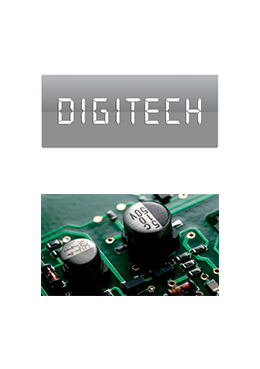 Such technologies include the MULTIPLEX® System, DUOPASS® System, ALLINCLUSIVE® System, DIGITECH® System, and finally our greatest achievement the FLOW-TECH® Heat Exchanger, which are widely known and appreciated around the globe. Recognizing a need, and the potential of North America, Radiant is now available in North America for the first time ever. Our head offices are located in Toronto, Ontario Canada, with independent rep agencies strategically placed in both Canada and the United States. At Radiant North America, we recognize that the journey with our customers begins with products that combine the highest in quality, reliability, longevity and efficiency. We also recognize that customers demand value and we work with our trade partners to ensure that they receive the value they expect and are entitled to. This process starts with the initial purchase, and continues throughout the life of the product. The thousands of people involved in producing and delivering a Radiant product to your home or business understand that if you are not satisfied, we are not satisfied. Radiant is committed it minimize environmental impacts throughout its production and delivery channel. Our production facilities are ISO 14001 certified, and we meet or exceed legislative codes and practices in all our activities. As we continuously improve, we do so with environmental consequences top of mind. We purposely incorporate cleaner technologies into our product development activities and have established contingency plans in the unlikely event of environmental incidents. We offer an array of training materials, including access to manuals, product specifications, designs, and literature, utilizing hard copy, the internet and e-book technology, where our manuals can be downloaded onto smart phones and tablets. Our fully functional training wall has several Radiant products installed, and fully functioning. This gives the technician the ability to get familiar with the product with hands on experience, and real time trouble shooting. At Radiant, we stick to the real meaning of the word “Partnering”, working closely with our clients to ensure we are always communicating with the main objective at the forefront “Continuous Improvement” constantly looking for ways to make things better. 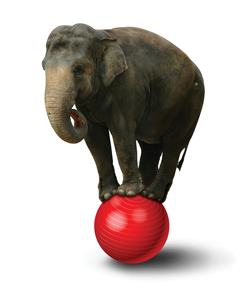 Looking for benefits for both partners and delivering not just what the partner expects, but exceeding those expectations. We add value to partnerships that enable them to grow. A “Radiant” partnership has to work for both partners. Or it’s not a real partnership. At Radiant, we continue to develop an excellent reputation, built solidly around the key requirements of ALL our trade partners, – quality, reliability, energy efficiency and excellent global support services. We have been at the forefront of heating technology for over 50 years and continue with our product line of condensing or non-condensing boiler technology. Many of our boilers have the built in capability to produce domestic hot water; others can be coupled with indirect hot water tanks to provide it. All of our condensing boilers meet the California NOx emission requirements. 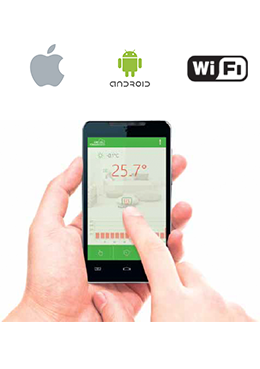 Our latest products takes efficiency to the next level, coupling the advantages of central boiler systems with the ability to specifically control the level of comfort in individual residential or commercial suites via the Cloudwarm® App. Available for IOS and Android. Floor heating, Hot water on demand, or a traditional radiator… Radiant has a product to fulfill you and your customers needs. Discover the benefit of using patent pending Radiant Ecosmart Air Handlers to reduce the cost of heating your home and hot water. One source, two outcomes. 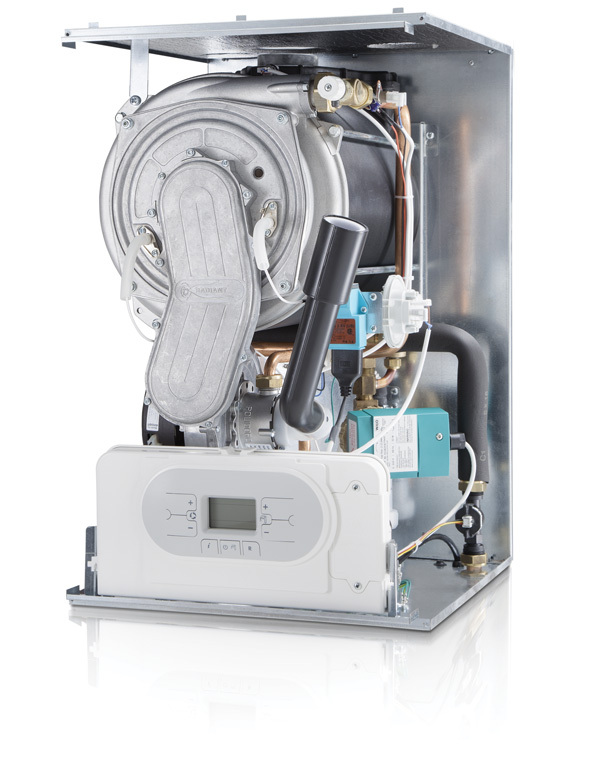 RADIANT boilers offer a remarkably high 97% thermal efficiency. This means that $0.97 out of every fuel dollar goes into heating the water, dramatically reducing the operating cost of the equipment. RADA achieves this efficiency through the combination of an advanced fan assisted combustion system and highly durable 316 stainless steel exchanger. A time tested proven combination. Since 1959, Radiant has been on the cutting edge of heat exchanger design. Designing and manufacturing from the ground up, Radiant has built their own heat exchangers in house from day 1. 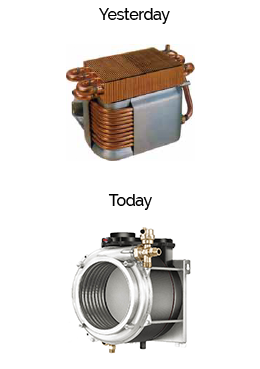 With a constant focus on efﬁ ciency and reliability, the heat exchanger has evolved into the heart found in each Radiant product. The newly introduced Flowtech heat exchanger is made from T316 stainless steel, with a tube diameter of 28mm, which makes for higher efﬁciency numbers, 97 EF to the 0.954 UEF, less head loss, and easier maintenance. With 57 years of unparalleled experience and know how… the Flowtech heat changer comes with a 10 year, no questions asked warranty. What venting systems are approved for the Radiant condensing and non-condensing boilers? Radiant condensing boilers are approved for the use of standard polyvinyl chloride (PVC) venting. This is about the most inexpensive venting material available. System 636 PVC & CPVC venting is approved, as well as Polypropylene. 2″, 3″, and 4″ venting options are available. Please check the “allowable vent lengths” of the product you are interested in for correct specifications. Some manufacturers say that their boilers are field convertible from natural gas to propane, or from propane to natural gas. Does Radiant offer this feature? Radiant provides boilers that are specifically configured to operate on natural gas or propane. We do this for two reasons. 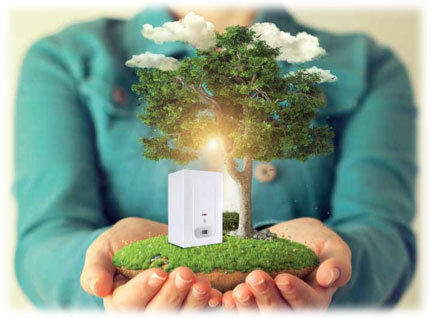 Firstly, we want to ensure that our boilers operate at the peak efficiency. To do this requires both adjustments to the way the boiler operates and ensuring that the correct burner ‘jets’ (referred to as orifices) are in place for the type of gas being burned. Second, if a mistake is made in the field and the boiler is set up to burn one type of gas, but burns the other type, serious consequences can result, up to and including carbon monoxide being released into the building. Our boilers are set up in house prior to being shipped out the customer ready to operate as they are intended with either fuel. This eliminates costly errors out in the field and down time to customer. Can I use anti-freeze in my Radiant Boiler? Yes. You can use propylene or ethylene glycol (not automotive anti-freeze) up to a solution of 50% by volume; that is half water, half glycol. The resulting solution is more viscous (thicker); therefore, the pump that is built into the boiler will not be able to pump as much fluid through your system compared to if you are using just water in the system. You must use an inhibitor with the glycol. I understand you require that I must use a cleaner and inhibitor in my system when I install a Radiant boiler. Why is this? We highly recommend that your contractor use a cleaner when installing a Radiant boiler. This is particularly true if the boiler is replacing one in an existing system. Over the years, debris from the various components of the system builds up in the system. The tolerances in your old boiler may be such that this has not caused a problem. However, with today’s new equipment having much tighter tolerances (just like your new car engine, compared to that of an older car), this debris can clog up some of the components in the boiler. With a new system, as long as the system undergoes a cold and hot flush, adding a chemical cleaner is not as crucial but still recommended, as bits of solder or solder flux, for example, may find their way into the boiler. How do Radiant boilers perform at higher altitudes? There is no technical height restriction for Radiant boilers. The boilers are set up by adjusting to certain carbon dioxide percentage targets at maximum power and minimum power. These values are independent of the altitude at which the boiler is installed. However, the boiler will be de-rated depending on the altitude; for example, at 7,000 feet the boiler will operate at approximately 83% of its maximum input. Therefore, you will need to account for the fact, that at altitude the boiler will produce less heat. This is true for all heating appliances due to the fact that the higher you go, the less dense the air is. All Radiant boilers come with pumps that have air eliminators built in. Your contractor will open the eliminator up to bleed the air out of your system. Cold water holds more air than hot water, so when first filled with cold water, the system contains a lot of dissolved air. Once your boiler heats the water, the air comes out of solution and moves with the flow of water. It is important to remove the air because it can block the flow of water. Air will also cause noise as it moves though the pipes. A heating professional will also use automatic air vents at the high points of a system to eliminate air bubbles that do not generally move downward with the flowing water back to the air eliminator because of their buoyancy. It is highly recommended that additional air eliminators are added to any heating system in addition to the air eliminators that comes factory installed in every Radiant product. A low water cutoff prevents the boiler from operating if the system has less than the recommended amount of water in it. Radiant boilers are equipped with a pressure transducer that cuts off power to the ignition sequence if the pressure of the heating circuit water falls below 0.7bar (10.2psi). This effectively eliminates the need to add a low water cut off. Having said that, many jurisdictions still require that a low water cut off is to be installed. Please check with your local rules and regulations prior to installing you new boiler. What is the warranty policy and process for the Radiant product line? The first two digits, in this case 37, correspond to the year 2007 and the next two digits, in this case 07, correspond to Week 7 of the production year. 2 years on every component within the cabinet. Breakage during transport, lack of water, freezing, fire, theft, storm, vandalism, corrosion, condensation, poorly performed descaling, sludging, ineffective chimneys, insufficient or improper ventilation, presence on site of any other equipment which may discharge noxious or dangerous gases, improper evacuations and discharges, improper use of the equipment, installation in an unsuitable place. Normal wear, such as anodes, circulators, gas regulators, diaphragms, etc. This warranty does not cover the labour and shipping costs associated with installing a repaired component or replacement of a boiler. Thermal Hydronic Supply Ltd. is the sole company authorized by Radiant Bruciatori S.p.A. Italy to execute the warranty work outlined above. You also have the option to couple your boiler with an air handler and traditional duct work in your home. You now have the combined benefits of a high efficiency hydronics heating system with the ability to operate a central air conditioning unit. Your home will function and operate just as it does the use of a furnace. Only there will be one combustible source to generate your heating and how water demands, not two. One gas line, one vent, and one appliance using fuel and consuming energy, which also allows you to eliminate the need for a hot water tank in your home. Lowering household expenses and saving you money. The benefits are endless. There are actually a few reasons to consider changing out an old boiler, assuming you mean your boiler is older than 20 or 25 years. Firstly, the technology has advanced a long way in the past couple of decades, so a new boiler will use a lot less energy than your current old one (see the question about condensing and non-condensing boilers below). Second, parts may not be available for your old boiler, should you have a problem. If this happens in the middle of winter, you are going to have to make a very quick decision about replacing a non-functioning boiler. Most boilers get changed before they completely fail for these reasons. Updating to new technology has many benefits. The contractor will then select a Radiant boiler that operates within the maximum heat loss of the building. Since Radiant boilers modulate, the Radiant boiler selected will operate at the heat output that matches the heat loss of the building on the coldest day, or on milder days at optimal efficiency at all times thanks in part to a 9:1 or 10:1 modulation rate depending on the model you choose. Most of the time when your boiler is operating, it will not be the coldest day of the year. 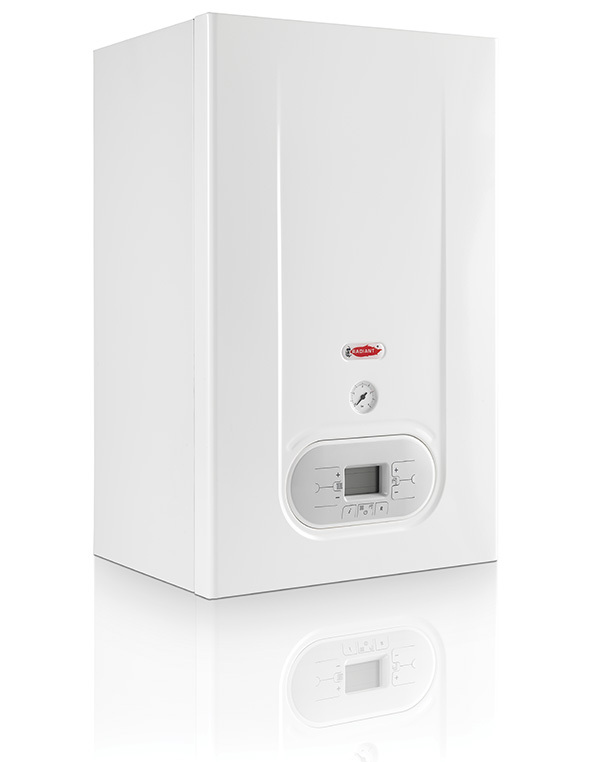 In these cases, you do not want your boiler to operate at its maximum output as it will then cycle on and off more frequently than necessary. This will result in it operating at less than its best efficiency, using more fuel and greater wear and tear on the appliance, much like a car driving in stop-and-go traffic, compared to on the highway. 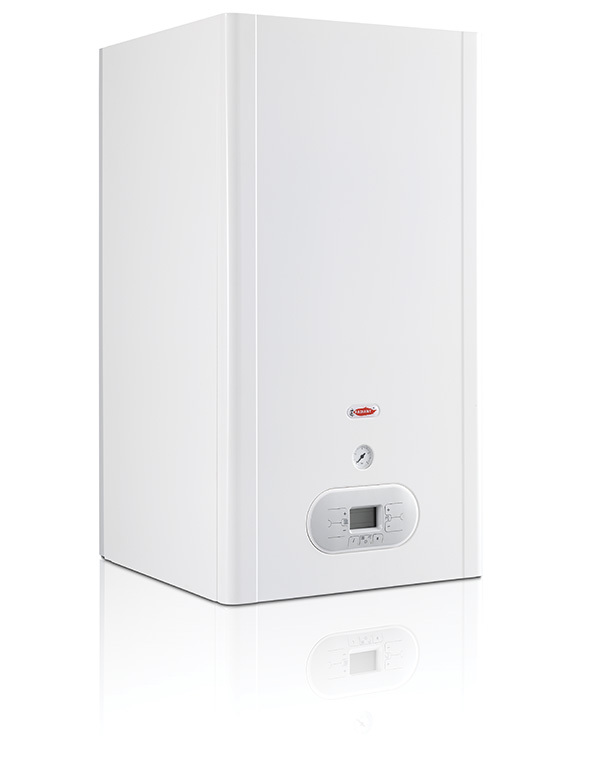 Radiant boilers are designed to ‘modulate’, that is match their heat output with the heat required by the building. In this way they operate at the highest possible efficiency, for the conditions, all of the time. Your Radiant product comes with a 10 year warranty on the heat exchanger, and a two year warranty on all components. Please refer to your owners manual for the exact terms and conditions. © Copyright 2016 | Radiant North America. | All Rights Reserved | Website development by Virtace Inc.